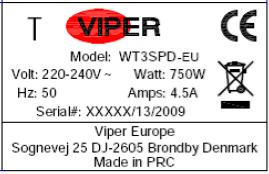 Furthermore, every machine has a label comprising indication of the serial number and manufacturing year, as well as the CE seal, the weight, the power, the model, the amperes, the voltages and the Hertz. The CE-declaration is required for any apparatus put into service in any EC member state, whether imported into the EC or manufactured in the EC, by the one who actually puts the equipment on the market. The declaration should be signed by a responsible person, at the point of entry in the EC.